Nice, cute and clean visuals. Music worked pretty well too. Obviously would have needed some sound effects and more polish on the visual side as well. As already stated by others, getting a full on game over and having to just go grab all the stuff again was kinda tedious. Like if I jump to the water in the beginning it's fine but if I fall there with the balloon it's game over. Didn't quite make sense. Could have used some more hints on what could be built in game. Only things I found out how to build were the balloon and the turtle taxi. The hints you had there like the string can only join two objects together were along the right line but not really that helpful. Of course I was trying to join two things together with the string but if I didn't have the exact right ones the game was like "nope, those aren't objects, try using objects next time newb". First I made a balloon (without the feather) and you kinda gave away that I'll need to add the feather next time. After few failed landings with the balloon (WASD controls were for some reason inverted when flying, arrows weren't), I experimented more with crafting and managed to build the turtle cab. And with that, I sailed on... for what felt like an eternity. After I was just about to give up, I saw the island. And then it just went past it. After that, insert another eternity and almost giving up again and I see another island, sweet. Except didn't find any way to get there and the turtle was just stuck on place there. Was I supposed to do something there to get to the island, nothing seemed to do anything. Anyways, good job. As you and others have already discussed, it might have been a tad too ambitious so you couldn't really focus on the most important bits, the gameplay and final polish. Oh well, jams are all about the learning experience anyway so next time you'll know! The art is cute and the music is nice. Found the controls for the travel portion kinda tricky, and I kinda had to rely on the cheat sheet to create anything. The crafting idea definitely has potential though. The crafting mechanic has potential, but the controls after you build stuff is kind of hard to understand. The turtle with the carrot was quite a bit of waiting. 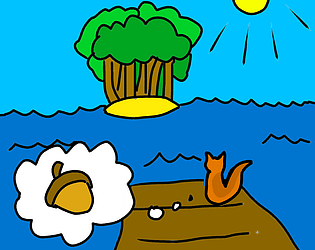 The idea of crafting household items as a squirrel to get to an island is interesting. But the execution falls quite flat. For starters, some combinations are not obvious, while others cannot be made. I tried crafting by myself quite a few times before I gave up and relied on the cheat sheet, because the combinations of item I made didn't work. The item combos that are there are interesting, and I like how there are different mechanics depending on what you build to get to the island. But the limitations surrounding them are ridiculous. Clouds are solid and you can't hit them--really?! 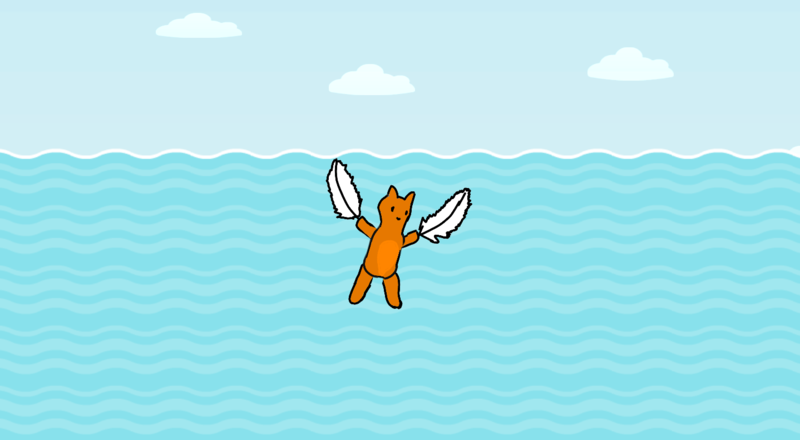 And squirrels can swim if they must (and yes, I googled "can squirrels swim" after you game told me "it's obvious you can't swim" [which is false]). I understand wanting to present a challenge to the player, but this is overdoing it a little. And the catapult item is near impossible to use, since it's very hard to tell how far you have to shoot to get to the island. The art is charming, but the writing is riddled with typos. And the music gets annoying fast. I don't find this to be particularly faithful to the original comic it's based on (which is the squirrels getting to the moon, not an island), but perhaps you changed it for a reason? Overall, I wanted to like this game, but I personally didn't enjoy it. I'm sure there are others who will, though. My regret is that you didn't have fun playing the game. We try to do it better at the new event. Have a nice day !